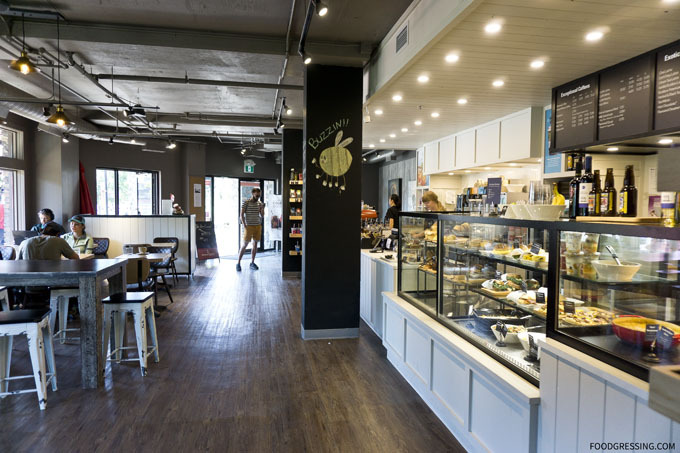 I had come to know Alberta-based Good Earth Coffeehouse when they expanded to BC with a location just outside UBC (see review here). So when I was in Alberta recently, I decided to visit one of their locations. 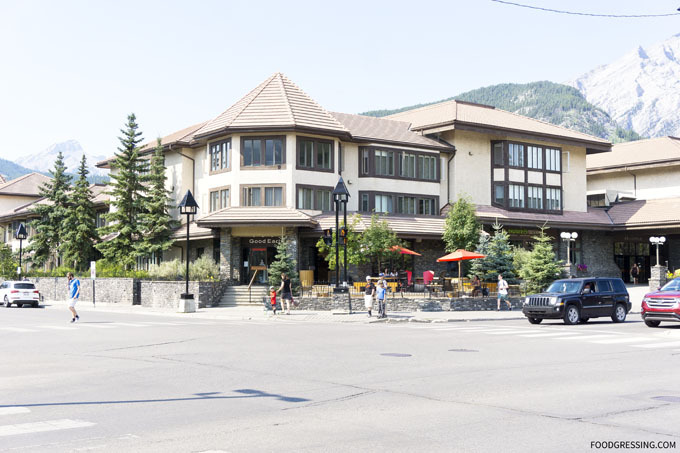 My family and I were staying in Banff and we visited their coffee shop for breakfast one morning. 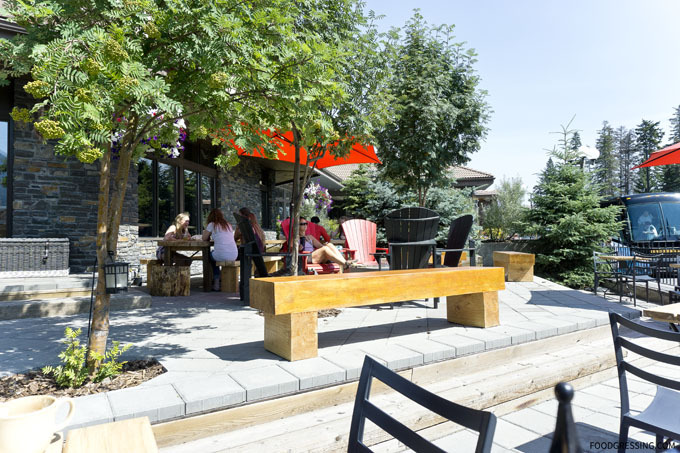 One of the nice parts of Good Earth’s Banff location is their large patio. 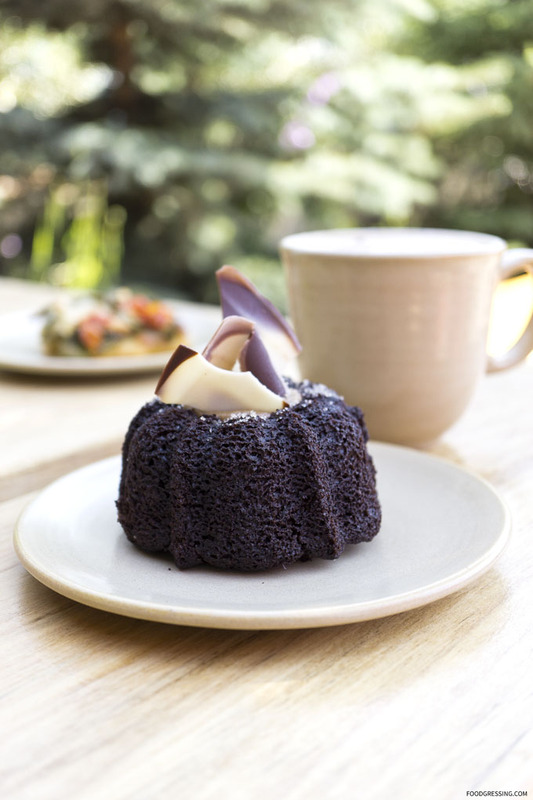 Nothing like enjoying views of the Canadian Rockies over some delicious coffee and food. Their interior is clean, spacious and has cozy banquettes, high top tables, counter seating by the window and regular dining tables. 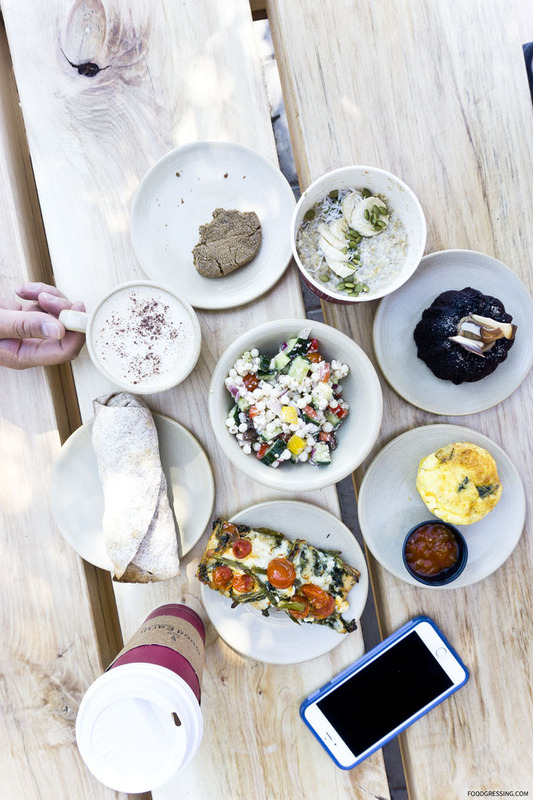 For our breakfast, we had a World Peace Couscous Salad, Southwest Breakfast Bake, Southwest Breakfast Wrap, Vegetarian Flatbread, Steel-cut Oatmeal, and Chocolate Maple Baby Cake. For drinks, we enjoyed a regular coffee and Chai Latte. 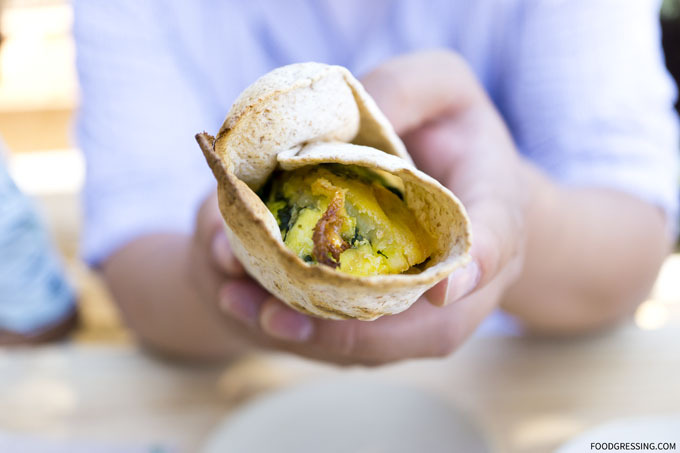 The Southwest Breakfast Bake and Wrap were tasty, easy breakfast on-the-go items. 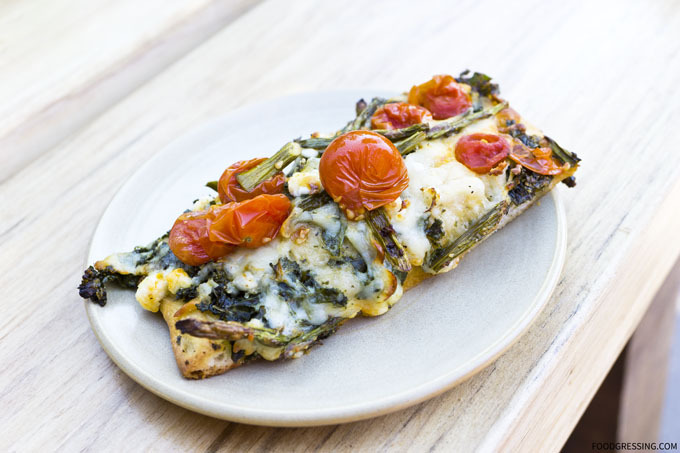 The Vegetarian Flatbread had a nicely crispy crust with cheesy and vegetarian topping. 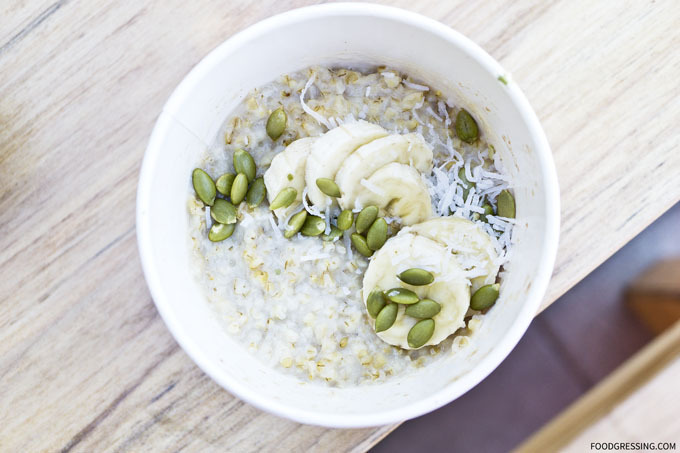 At Good Earth Coffeehouse, they serve only Slow-Cooked Steel-Cut Oatmeal. You can also customize it with fruit, nuts, and some sweet bits. And for something more decadent, there was the Chocolate Maple Baby Cake. Moist, fluffy and very chocolatey. Named by TripAdvisor as the top thing to do in Banff, the Banff Gondola to the top of Sulphur Mountain is not to be missed. When my family and I visited Banff this summer, we had the opportunity to ride the Banff Gondola which is operated by Brewster Travel. Here’s a look at what you can expect on your visit. 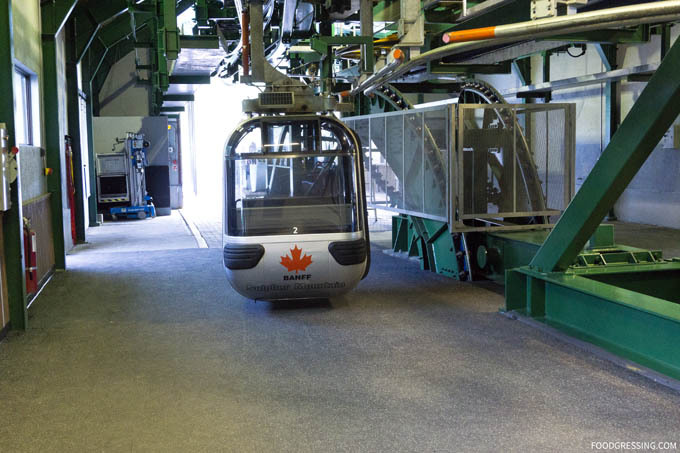 The journey starts with an 8-minute ride to the top of Sulphur Mountain on board a modern, fully enclosed four-passenger gondola cabin. Relax, sit back and enjoy the breathtaking views as you move past the treetops to an elevation of 7,500 ft at the summit. While the panoramic views of the mountain ranges are certainly exciting, what also awaits is the new state-of-the-art with new restaurants, interactive interpretive exhibits, a multi-sensory theatre and a breathtaking 360-degree rooftop observation deck. Check out the amazing video below that showcases the summit facility. The All-New Banff Gondola Summit from Brewster Travel Canada on Vimeo. The observation deck is where you want to be to take in the breathtaking vistas and fresh mountain air. 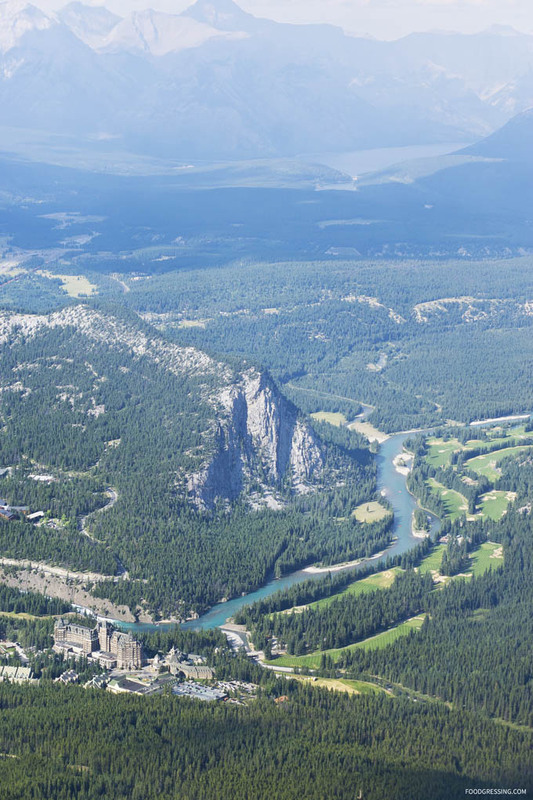 You can also spot the iconic Fairmont Banff Springs hotel in the distance. 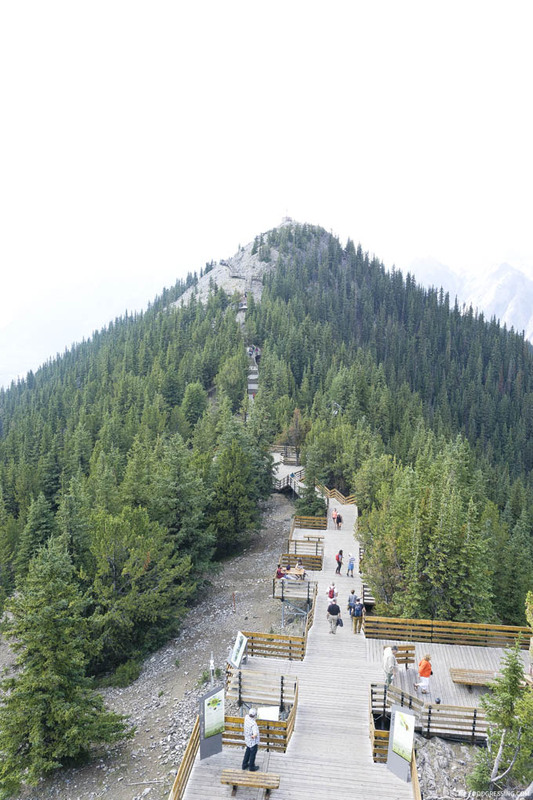 And for those seeking more adventure, there’s the Sulphur Mountain Boardwalk where you can explore several scenic hiking trails that lead away from the summit complex. 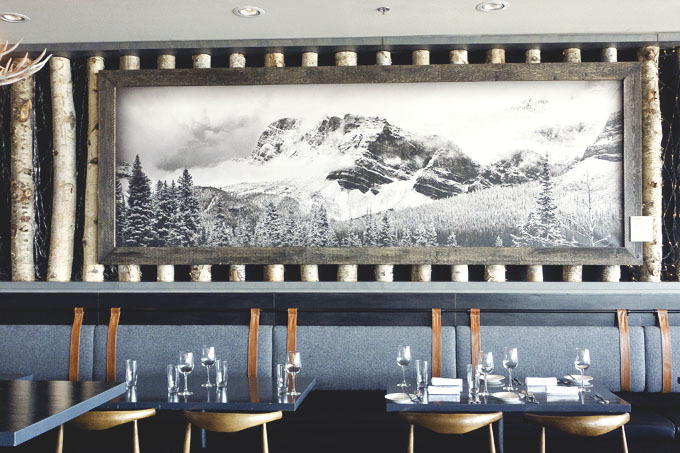 For the ultimate mountain top dining experience 2,900 ft above Banff, there is Sky Bistro which offers a Canadian menu featuring unique flavours of Canada with regionally-sourced local meats, produce and ingredients. 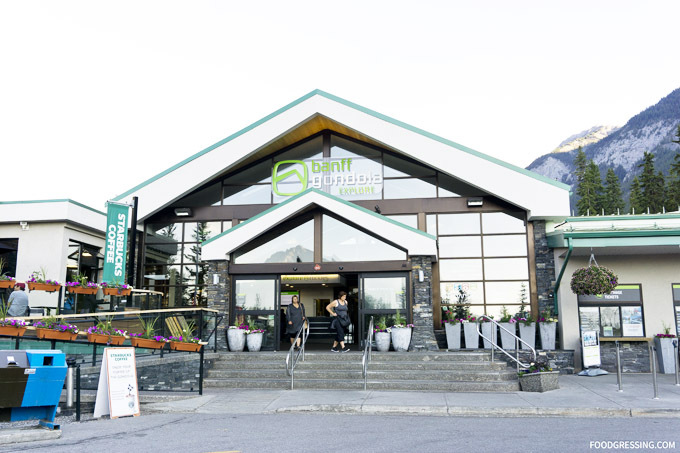 Visitors can take advantage of Brewster Travel’s Sky Experience Package which includes Banff Gondola admission and your choice of appetizer and entrée from the dinner menu starting from $109 (available daily after 5:00 PM). See my full review here on Sky Bistro. My family and I truly enjoyed our visit to Sulphur Mountain via the Banff Gondola and I highly recommend it if you are visiting Banff. 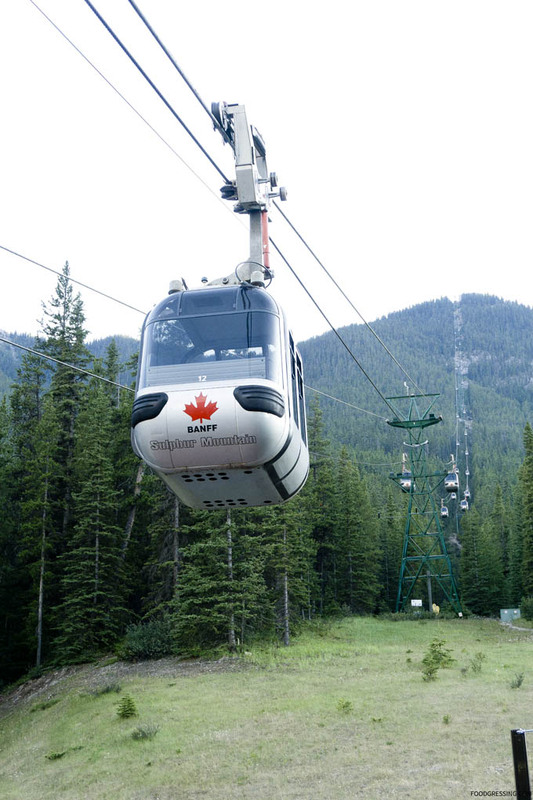 For more information, tickets and hours for the Banff Gondola, visit Brewster Travel. 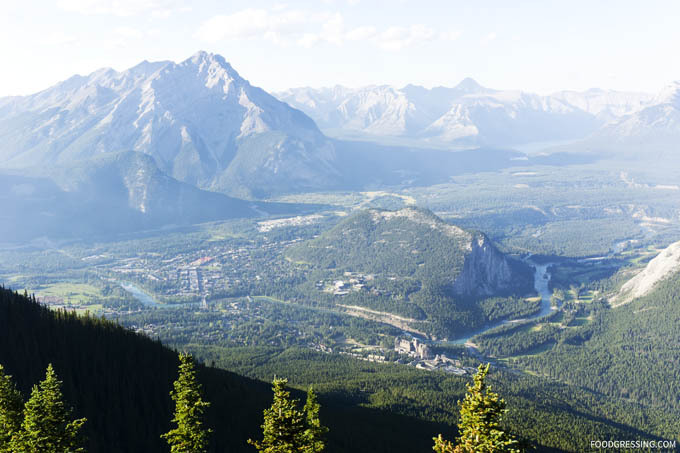 When visiting Banff, Alberta, one of the must-see attractions is Sulphur Mountain. 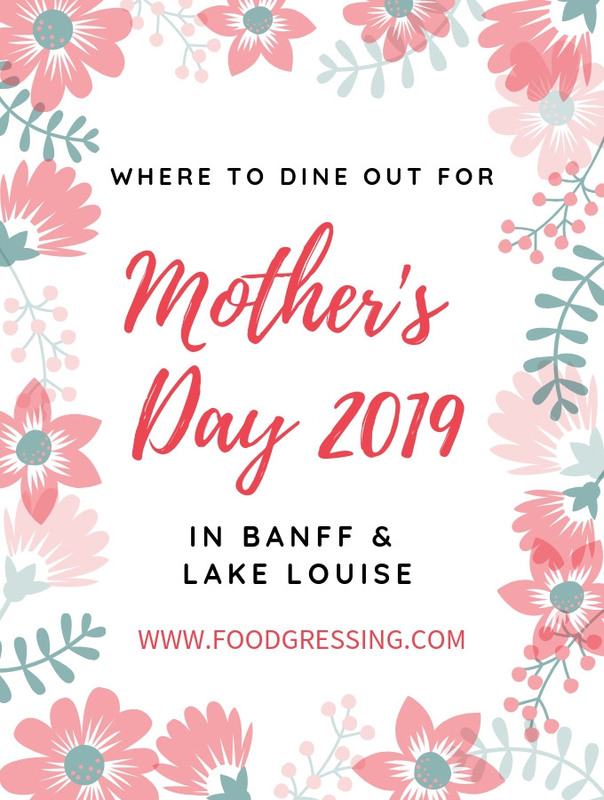 Part of the experience is embarking on the Banff Gondola to the top of the mountain and taking in the awe-inspiring views of the Canadian Rockies. What awaits you at the top is the newly transformed, state-of-the-art summit facility new restaurants, interactive interpretive exhibits, a multi-sensory theatre and a breathtaking 360-degree rooftop observation deck. 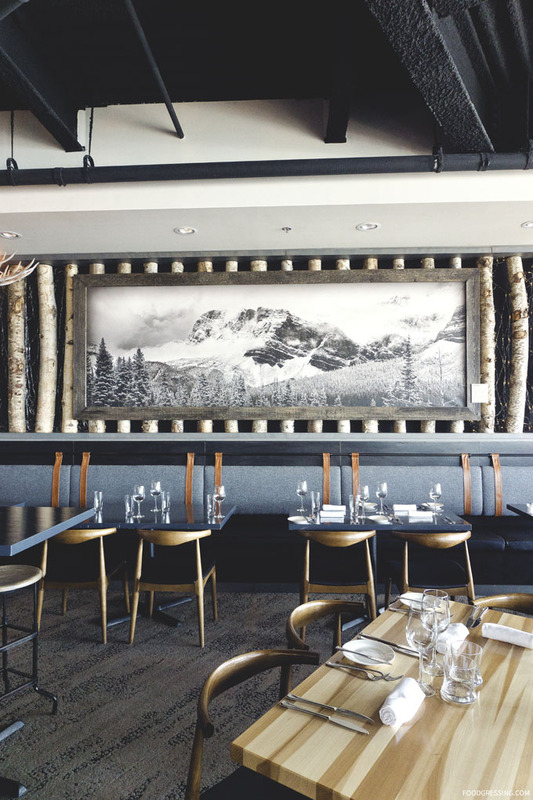 For the ultimate mountain top dining experience 2,900 ft above Banff, there is Sky Bistro which offers a Canadian menu featuring unique flavours of Canada with regionally-sourced local meats, produce and ingredients. 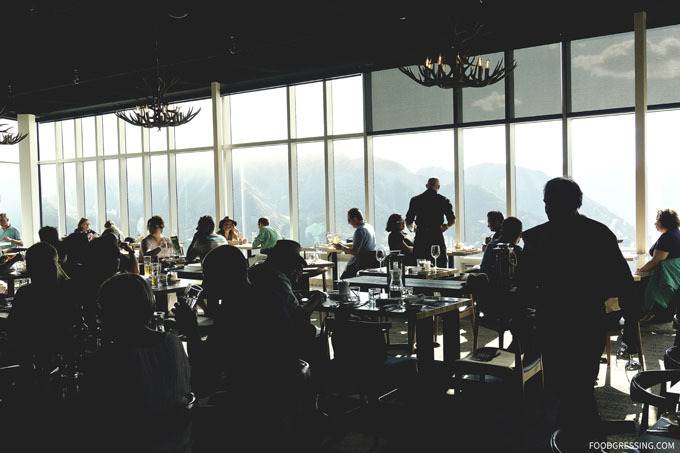 Visitors can take advantage of Brewster Travel’s Sky Experience Package which includes Banff Gondola admission and your choice of appetizer and entrée from the dinner menu starting from $109 (available daily after 5:00 PM). 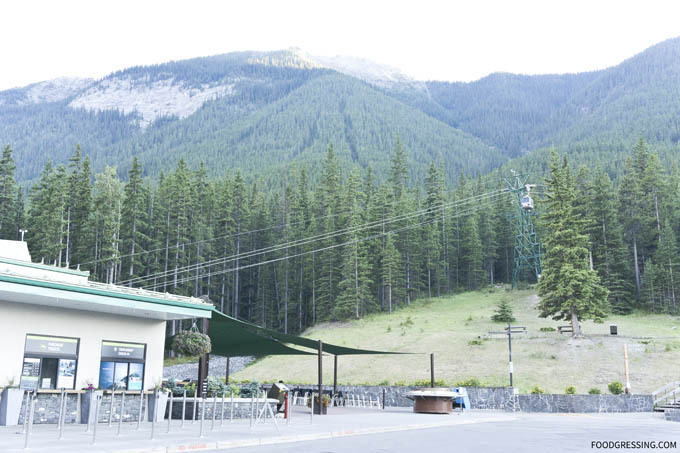 Last month, I had the opportunity to visit Sulphur Mountain and dine at Sky Bistro for dinner. 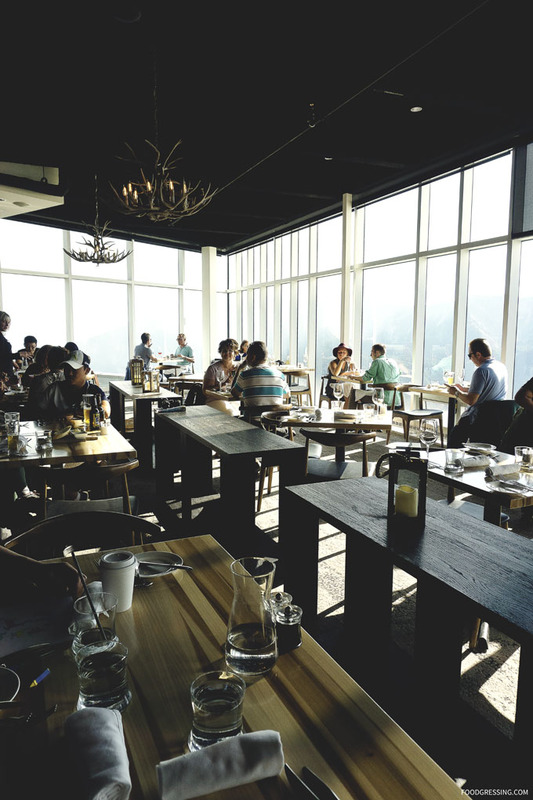 The interior of Sky Bistro is just stunning and not just because of the mountain views. I love the warm, cozy atmosphere from the rustic design which is fitting for its location in the Canadian Rockies. 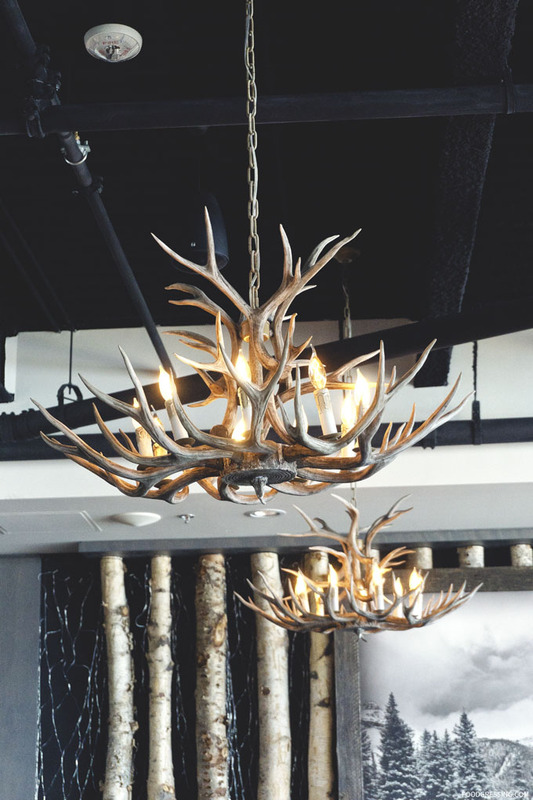 I really liked the vintage antler chandeliers. The majestic floor-to-ceiling windows offer majestic mountain views of the Bow Valley. The highly coveted tables along the windows are designed for two only. Larger parties are accommodated in the middle of the restaurant. To start, the Alberta Lamb Chops were very tasty with tender meat that fell off the bone easily and a nice smoky flavour. 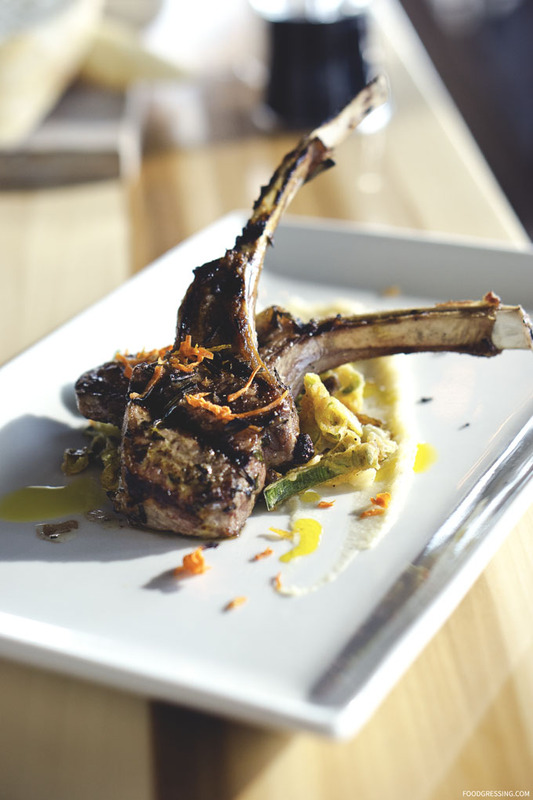 The lamb chops came with fried leek, candied carrot, crispy celeriac and cauliflower puree, and rosemary oil. 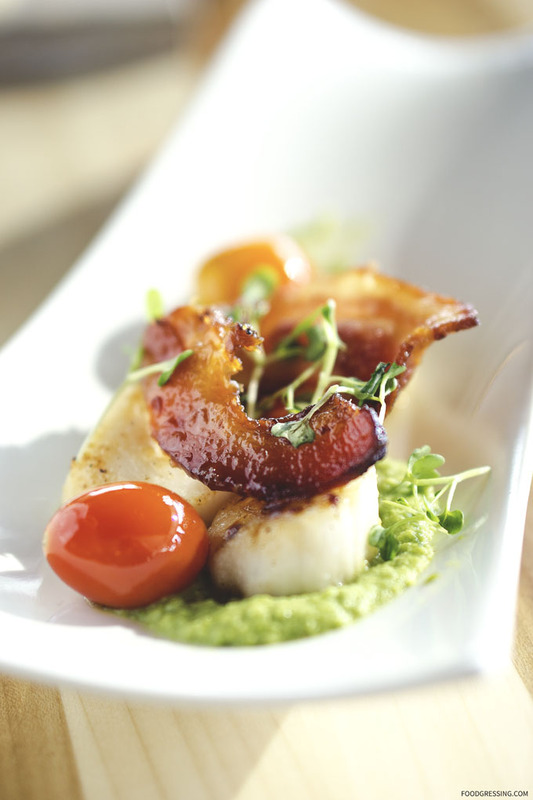 The Whiskey Maple Scallops featured Atlantic coast scallop with a green pea puree, blistered tomato, Quebec maple whiskey glaze, candied bacon, and micro greens. The scallops were seared perfectly and I like the very Canadian elements incorporated into the dish (Quebec maple whiskey glaze and candied bacon). I though the green pea puree balanced out the sweetness of the maple glaze and candied bacon as well as the butteriness of the scallops. 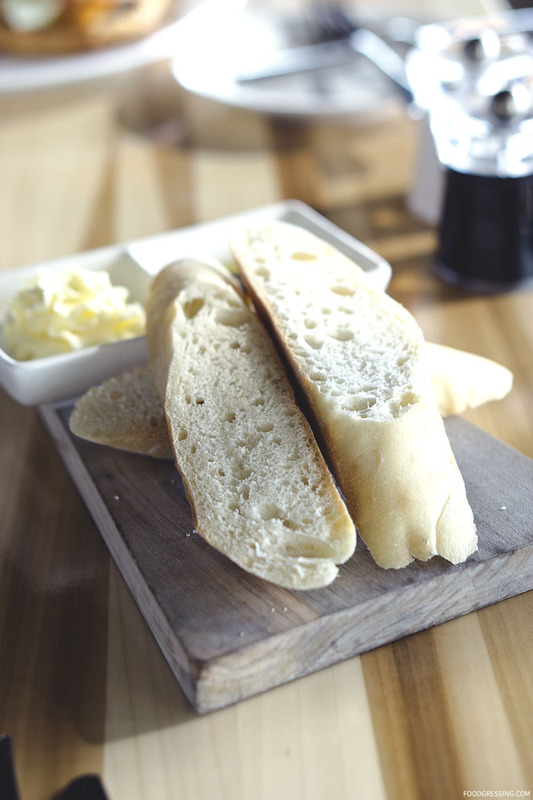 We also received some bread, balsamic vinegar and butter at the beginning of the meal. Moving on to mains, the Carmen Creek Bison Tenderloin was certainly a hearty entree. The bison tenderloin was wonderfully flavourful with a subtle sweet taste. It did not taste gamey at all. 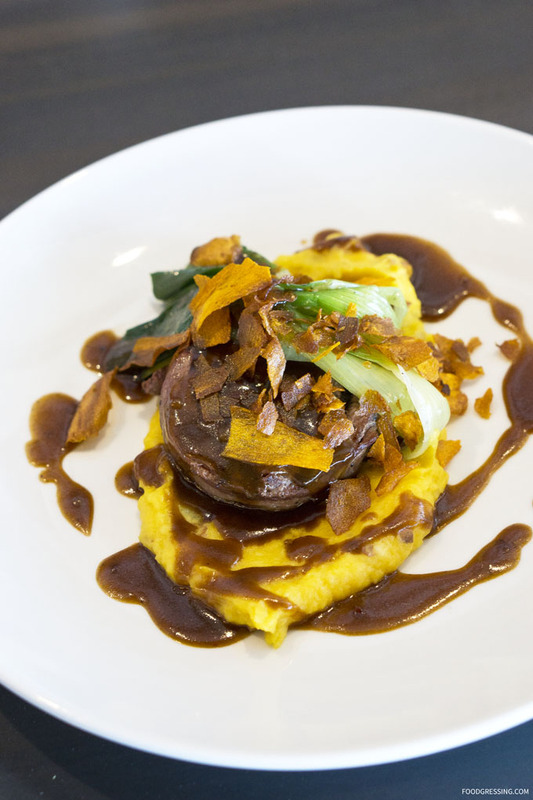 The tenderloin came wrapped in bacon with a red currant glaze and carrot and potato puree underneath. I particularly liked the braised leek which added a crispy texture to the dish. 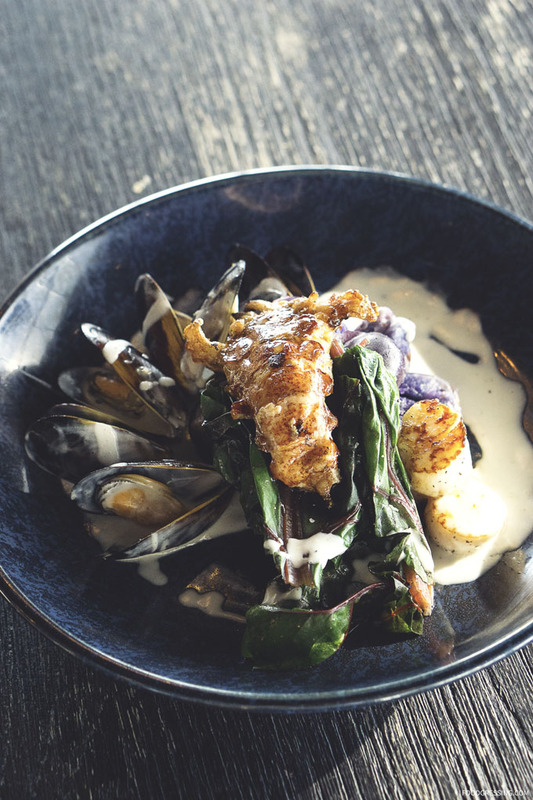 The Seafood Medley had Atlantic lobster, P.E.I mussels, East Coast Scallops, crushed purple potato, and Swiss chard. I quite liked how this dish allowed me to sample East Coast flavours (as I am on the West Coast). The purple potato added a bit of sweetness and I thought the Swiss chard was very flavourful. 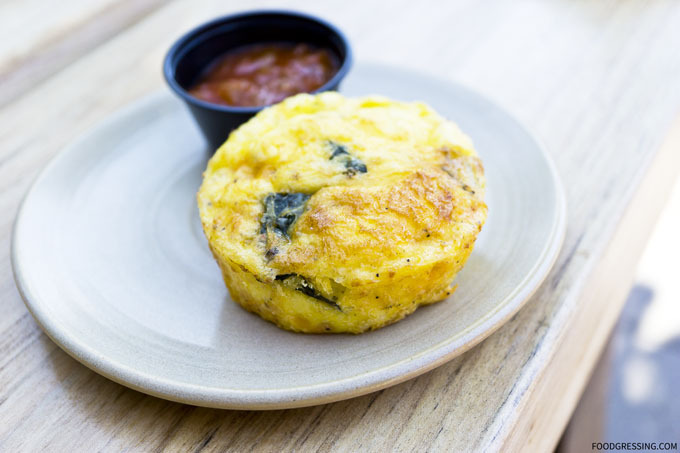 Sky Bistro is very family-friendly and they have a kid’s menu. 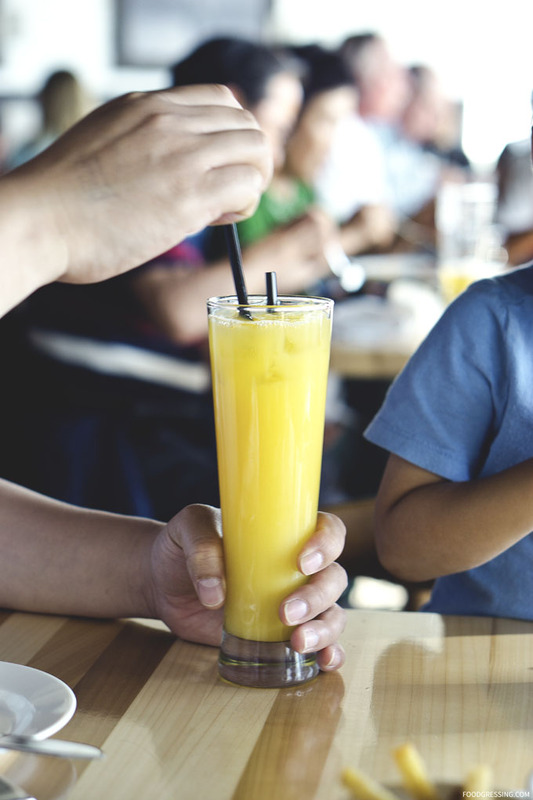 My son quite enjoyed the cheeseburger and orange juice. Sky Bistro offers a unique experience to dine above the clouds in Banff. While some may be wary of restaurants in touristy locations, I can attest to the fact that the food at Sky Bistro is top notch. 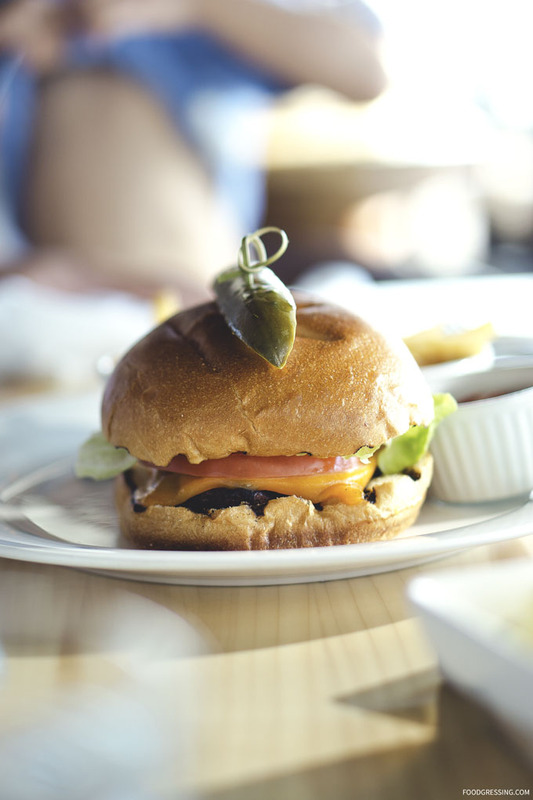 For locals and tourists alike, Sky Bistro allows diners to sample some of the wonderful culinary flavours that Canada has to offer.